In the Inspiring Women in Project Management series, I normally interview people who have had a relatively long career already. But you don’t have to be hugely experienced to inspire others. 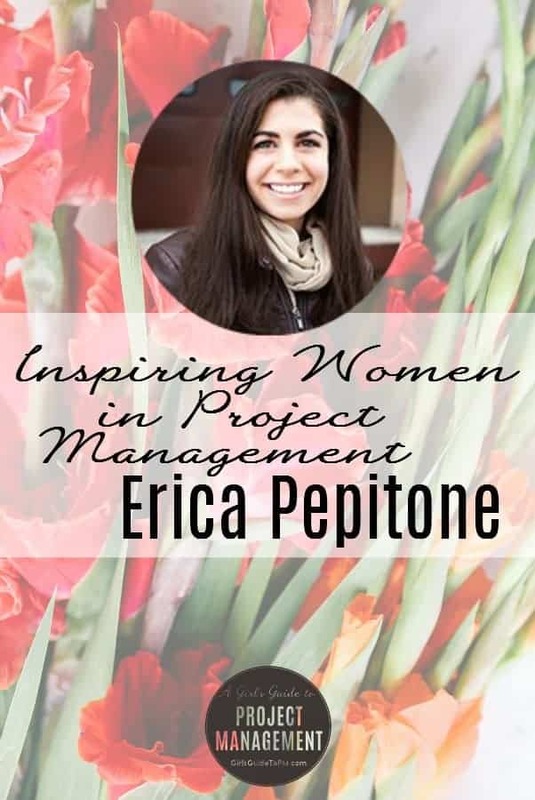 Today I’m interviewing Erica Pepitone, PMP, a first year project manager living, working, and learning in New York City. She’s recently moved from a coordinator job to a project management job – a leap that I know lots of people wonder about making. Erica, you made the jump from project co-ordinator to project manager. How was that for you? In my role as coordinator, I was lucky to have a manager who was an experienced PM and helped kick start my career as a project manager. Before officially moving to the role, I had plenty of opportunities to take on project management tasks, ask questions, and manage some smaller projects. I had people around who helped give me a confidence in my skill set and ability to perform the work before I moved to project management. It felt more like a transition to larger projects and coming into full responsibility rather than a large jump. That’s good! Sounds like you planned the move perfectly. How was it doing your PMP® prep and getting settled in a new job? I started my new role almost immediately after passing the PMP, and the exam prep was helpful in starting my new job. As nervous as I was about the exam, I have always enjoyed school and study. Because most of what I knew about project management was learned on the job, it was interesting to think about it as a discipline across all industries rather than just how it is practiced in mine. I enjoyed learning about the framework and foundations of why we do what we do and what it actually means when I plug numbers into a formula. What’s the hardest thing about your role right now? I recently moved to a new company and am still settling in. It is easy to get comfortable after being with the same group and get used to the same processes, templates, and order of operations. Switching companies and starting in a project manager role where there was none before can feel a lot like starting over completely because “the way we do things” no longer applies, and what worked for one team and one culture does not always apply to another. The most beautiful processes and best templates are worthless if they aren’t working for the team, and there’s some trial and error involved in refining processes so they work for everyone. The most beautiful processes and best templates are worthless if they aren’t working for the team. It’s been great for thinking about different ways to apply and adapt the experiences and skill set I have to new situations, and I’m learning a lot along the way. I’ve been fortunate to have wonderful mentors throughout my career so far, both before I was in project management to help steer me towards it and those who taught me most of what I know about project management. Having mentors has been integral to my career growth. My mentor in my first project management job not only taught me hard skills and best practices, but also helped me with some of the people skills required to navigate difficult situations. She was endlessly patient with my many, many questions, and I’m extremely grateful. There are also several people who I have never met but whose work I admire and turn to when I’m not sure what to do. There are books, research, and blogs out there (including this one!) who serve as “digital mentors” when I am working through a problem. What other career development things are you working on? I was heavily focused on PMP study in the spring, and since then have continued to read project management books, articles, and subscribe to online newsletters. In the past, I have taken classes directly or indirectly related to my work, particularly in areas where I feel I need improvement. For example, at one point when I was a coordinator, I felt intimidated by running meetings where I was both the youngest and most junior person in the room, but was lucky enough to work with people who encouraged me to seek training and am now very confident in meeting facilitation. I also like to have a few personal development projects, and for the last year I have been tasking ASL classes. While it’s not directly related to project management, it’s had me thinking more about communication, perspective, and accessibility. Having outside projects makes me more mentally energized across all my work and, who knows? Maybe it will come into play as a PM someday. That’s really interesting! I learned baby signing when the boys were small and it does give you a different take on communicating. What do you wish students were taught about project management? I wish they were taught that it was an option! Despite knowing people in the industry, I never understood what project management was growing up. I think there are a lot of people who have the skill set and would have an interest if only they knew what the job entailed. At the risk of sounding like a recruiter, where do you see yourself in 5 years’ time? I hope to still be working in project management, helping to bring organisations through different levels of project management maturity, and making different mistakes from the ones I’m making now. I’d like to find ways apply project management discipline to some of the projects and causes I care about. I hope I can be a resource to other project managers, especially those getting started, in person or through some form of writing. I’m sure you will. What tips do you have now for people just starting out? Even when your projects seem to be going well, do audits and health checks – don’t get too comfortable! Ask as many questions as you need to and ensure everyone in the room is on the same page and hearing the same thing. A lot of a project’s success depends on how the team works together, so invest in those relationships with your team members. Great advice! What is it about project management that makes you want to stay in the job? First, I am constantly learning new things about project management and the products I’m working on, as well as meeting a variety of people with different backgrounds. I love connecting with others, helping them where I can and allowing them to focus on what they are an expert in. I like getting a holistic understanding of a process or product and seeing how everything fits together to deliver results. A lot of projects are like puzzles, and it can be very satisfying to see one through to completion.